The wife of the US treasury secretary has apologised for an Instagram post in which she boasted of her wealth and belittled a commenter. The post showed Scottish-born actress Louise Linton exiting a US military plane, and was tagged with the brand names of several fashion designers. It also featured a paragraph-long rant against one user who criticised her. "I apologise for my post on social media yesterday as well as my response," she said late on Tuesday. "It was inappropriate and highly insensitive," she said in a statement released to US media by her publicist. 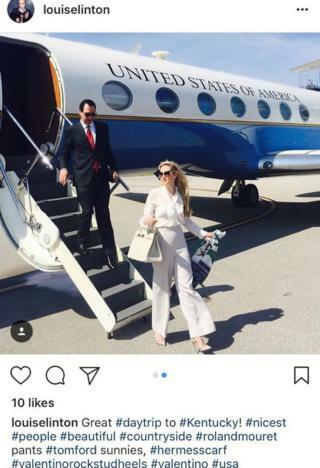 Her now-withdrawn Instagram post on Monday depicted her travels to Kentucky with her husband Steven Mnuchin, who is currently working to overhaul the US tax code. In what critics have suggested could be a government ethics violation, she tagged designers Hermes, Tom Ford and Valentino on to the image of her and her spouse exiting the blue plane with United States of America emblazoned on the fuselage. "Glad we could pay for your little getaway," commented @jennimiller29, who is reportedly a mother-of-three from Portland, Oregon. "Did you think this was a personal trip?!" Linton wrote back, tagging the woman. "Adorable! Do you think the US govt paid for our honeymoon or personal travel?! Lololol. Have you given more to the economy than me and my husband? Either as an individual earner in taxes OR in self sacrifice to your country?" News outlets dubbed this Ms Linton's "Let them eat cake moment", a reference to a comment reputedly made by French queen Marie Antoinette upon hearing the citizens of Paris had no bread. A spokesman for the Department of Treasury told CNN: "The Mnuchins are reimbursing the government for her travel, and she does not receive compensation for products she mentions." This is not the first time Ms Linton has courted controversy. In July 2016, she published a memoir of her experiences volunteering in Zambia during her gap year, which provoked a huge online backlash as reviews and comments accused her of being patronising, inaccurate and misleading. Ms Linton and Mr Mnuchin were married two months ago at a black-tie event attended by President Donald Trump, his family, US cabinet officials and Wall Street executives. It featured Scottish bag-pipes, and the marriage ceremony was officiated by Vice-President Mike Pence. Mr Mnuchin made his fortune at Goldman Sachs before founding a Hollywood production company that has been behind such box office hits as the X-Men franchise, Wonder Woman and American Sniper. The actress featured in 2016 horror films Cabin Fever and Intruder. She was briefly named interim chief executive of Dune Entertainment when Mr Mnuchin stepped down to become treasury secretary, the Hollywood Reporter writes. She is Mr Mnuchin's third wife, and he is her second husband.